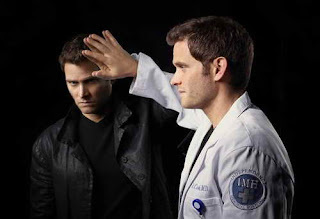 I see the premise of Do No Harm is about a man, (Steven Pasquale [Rescue Me, AVPR: Aliens vs Predator - Requiem]), a neurosurgeon, who has an alter-ego. And apparently the two personalities have very different lifestyles. Hence, Dr. Jason Cole / Ian Price are always at odds with each other. The doc has a respectable life while his dark side, Ian Price, likes spending all the money the doctor makes. "A brilliant neurosurgeon has to battle his own alter-ego so that he can live a normal life." Ha! There's no such thing when you have a dark side! Up until recently, I thought it was just a cute and maybe even interesting premise. But then, after the latest TV ad, I saw where the two alter egos are leaving each other nasty messages. And then it hit me... between tackling this modern day angle on another old classic story, it also tool a page from the 2008 TV series My Own Worst Enemy, that starred Christian Slater. And I loved that premise. In MOWE, Slater played Edward Albright / Henry Spivey. By day, Henry Spivey was an efficiency expert, boring day job, married, etc.. But when needed, his spy agency would activate a chip in his brain and that would bring out secret agent Edward Albright. Albright was part of an organization or team of agents who all had the chip in them. But something goes wrong with Albright's chip and he suddenly finds himself either reverting back to the mild-mannered citizen in the middle of gun fights, or, while at home, Albright would show up. The spy action was incredible for a TV show, but the story with the spy agency and all the double-brained chips got convoluted and viewers were lost in the translation of trying to keep up with who was who... or when was who, to be exact. Especially when you had a team of agents who were swapping in and out of their lives. But what I loved was when Albright and Spivey started leaving messages for each other. Or when jealousy was erupting between the two personalities and Spivey's wife was all aglow in the morning and would say things like "I had no idea you knew how to do 'that'"
The conflict was incredibly enjoyable but alas, the show was canned. MOWE was also an NBC series brought to us (written) by Jason Smilovic and I thought this inner turmoil bordered on brilliant. And when I saw the ad where the two personalities are leaving video messages for each other, I got hopeful. No one from MOWE is on Do No Harm, but the exec producers include Rachel Kaplan, David Schulner and Peter Traugott. Schulner is credit with being the creator of this new series. Footnote: In the world of movies, the director is the one in the command chair and it's their vision that forms the end product. But in the TV world, the executive producers are the ones who helm the overall direction of a TV series. EP Kaplan has a very short and nondescript resume.Traugott exec produced Samantha Who?, and the the pilot episode of Ringer. Schulner's resume on the other hand includes Tell Me You Love Me, Kings, Trauma, & The Event. If he brings his creative perspectives and combines them with the cast, which also includes Alana De La Garza, Ruta Gedmintas, Phylicia Rashad, Samm Levine and other somewhat fresh faces, NBC just might have themselves another genre-like hit on their hands in the guise of Do No Harm. 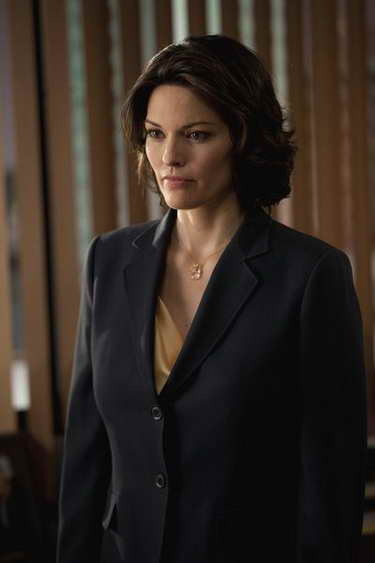 If you're wondering if you've seen Alana De La Garza before, think Law & Order! And I for one know I'll be enjoying seeing her on TV once again!